Using Greene's book of the trip, Journey Without Maps, and other exhaustively researched material, Butcher does an amazing job of providing the reader with a potted history lesson, both of the countries which he travels through and of Greene's journey. 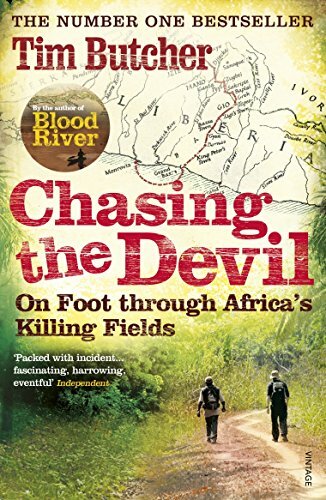 The real skill is that he also strikes a perfect balance paralleling his own journey, also imparting additional information from previous trips spent here whilst reporting on one of West Africa's most brutal wars. Butcher's journey is a brave one, both in terms of the distance covered on foot (c. 350 miles) and the potential dangers faced, both from humans and non-humans. Butcher's easy-to-read style provides us with exposure to one of the least travelled regions on the globe and whilst not overly imbued with hope for the two countries he spends most of his time in, we are nonetheless left with a desire to possibly checking it out for ourselves one day. Definitely one to read for anyone interested in West Africa, the civil wars that took place here, or anybody simply looking for good travel writing. Given the span of time between when Chasing the Devil was written, here's hoping that Butcher has another book waiting in the wings for us.